Merlin’s name appears in recently discovered MSS. text. 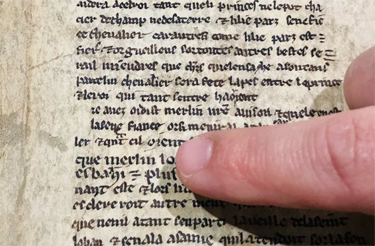 Medieval fragments of Arthurian legend have been sitting in the Bristol Central Library for hundreds of years and no one noticed—until now. The newly discovered text—hidden in a later book—tells of a battle in which Merlin leads a charge using a dragon banner that actually breathes fire. The 13th-century manuscript pages were tucked away in the binding of a later, printed book, a four-volume set of the works of Jean Gerson, a French scholar and theologian. The Gerson text was printed in Strasbourg, on the French-German border, sometime between 1494 and 1502, before making its way to England. ”The [Gerson] text would have come to England unbound, without covers—it’s lighter and easier to travel that way,” explains Leah Tether, a librarian and president of the British branch of the International Arthurian Society. “In England, whoever ordered them would then have taken them to a local bookbinder, and he would have added the covers.” That’s where the much earlier Arthurian pages came into play. Paper-making and bookbinding weren’t yet codified crafts in 16th-century England, and piecing together fragments of old manuscripts to hide unsightly binding features of new books was a trick of the bookbinding trade. Vellum pages like those of the Arthurian fragments were written on painstakingly prepared calfskin. Too precious to be thrown out, vellum, regardless of what was already on it, would have been kept in a workshop to be used again in a pinch. In this case, they had been repurposed as pastedowns, or the endpapers covering the boards of the Gerson book’s inside cover. The Arthurian manuscript is written in Old French, the first language in which the tales were recorded. “We can tell immediately by the handwriting style that it’s from the 13th century,” says Tether. While library scientists are still working to pinpoint its age, they believe it dates from some time between 1250 and 1270. The earliest known Arthurian texts are from 1220, so this is a remarkably early version. Tales of King Arthur were passed along orally long before they were written down. It would still be at least a hundred years from this French text’s time before they were written down in English. The librarians have determined that the newly discovered pages tell the story of the Battle of Trèbes, in which Merlin, King Arthur’s advisor, exhorts Arthur and his worn-out troops to persist in their fight against King Claudas, after which he leads the charge with the fire-breathing magical banner. There are some minor differences between how the battle is described in these pages and the version commonly accepted today. For instance, the story usually states that King Claudas suffered a thigh wound in this battle, considered a metaphor for castration or impotence. In the newly discovered version, the type of wound isn’t specified. These early details may change our understanding of the familiar tale, and tell us more about how the story changed as it went from oral renderings to French to English—and to modern versions. the Archives of Never Yet Melted in the 'Merlin' Category.